What do you call a movie about a highschooler made of iron who skips school? Call it ‘The Drone Collector’. As of today, Operation Protective Edge has been going on for almost four weeks. There doesn’t seem to be a clear end in sight at the moment. Here’s some thoughts on what it looks like to me. While Israel is probably justified in responding to attacks from Hamas, the entire thing is completely stupid. Well, you can’t bomb Hamas out of existence. It’s just not going to happen. Why does Hamas exist in the first place? Well, I don’t claim to be an expert on the Middle East. But there are several problems here. First, unemployment is around 30%. That is not to say that unemployment is the root of all the problems; and in fact may not be, as crime does not necessarily go up when unemployment goes up. In addition to just the unemployment, the population in Gaza is very young. If the Freakonomics guys are to believed, that is the root of the problem here. Essentially, people have no future, so they turn to the one organization that can give them something: Hamas. Now, back to the central question: Why can’t we just bomb Hamas out of existence? Well a few reasons. Hamas does have a legitimate grief against Israel, to the extent that Israel takes up much more land now then they originally were supposed to in 1947, and is currently occupying the West Bank. Bombing people will, in general, make them resentful. The danger of Hamas isn’t in guns and bombs. The dangerous man is the one who has only one idea, because then he’ll fight and die for it. I don’t know if the above quote is actually from Crick, but I have seen it attributed to him. This is the main problem with Hamas – they have an idea, and people turn to them because they feel that there’s no hope(my thoughts, I don’t know if that’s actually true). If you want to defeat Hamas, you need to weaken them(duh). To do that, you need to reform them. That simply isn’t going to happen while bombs are still dropping; it creates a lot of resentment. A large investment in Gaza and the West Bank is what has to happen in order for people to have jobs and turn against Hamas. After all, Hamas was first elected because the people in Gaza thought that they would be able to give them a better life – since that hasn’t happened, people have begun to turn against Hamas. Since the sentiment is generally against Hamas, now is the time to come in and invest properly. You’re not going to solve any problems if you don’t talk to each other. Not talking to other people means that you don’t go anywhere. If you’re talking, you can at least get somewhere. So, apparently my website was hacked. It doesn’t look like a WordPress vulnerability(although I can’t say for sure). Anybody know where any logs are kept? Of course, passwords have been changed to 15+ characters in length, so that should keep any passwords from being hacked easily. How did Gravity get so many awards? I didn’t think that it was a very good movie. I mean, sure it was nicely made. It had good effects. But it was an hour and a half of Sandra Bullock breathing heavily and being incompetent. I just don’t see it. To some extent, a lot of people would freak out; on the other hand, you’re supposed to be a professional. Today, I had to compile a custom kernel driver for Ubuntu, and it took me quite a while to do. There are a lot of guides out there, but many of them don’t seem to show the right way, or they do it one very specific way. Fortunately, thanks to this person, I’ve figured out an easy way to do this which doesn’t involve re-compiling the entire kernel. Copy the Module.symvers file from your currently running kernel into the build directory. This is VERY IMPORTANT, as otherwise you will be unable to properly build and install the module. This may lead to errors such as “no symbol table for module_layout” in dmesg when you attempt to load the module. cp /usr/src/linux-headers-`uname -r`/Module.symvers . I just re-watched Transporter 2, and I came up with the best idea ever for an action movie. Well, technically I came up with it a few days or weeks ago, but now seems like a good time to post. What if we took Vin Diesel and Jason Statham and put them in a movie together? It’d be two hours of beating other people up. After all, most of their movies seem to follow the same basic plot. Guy goes on a mission/people are coming to get him. He beats them up. End of story. I’m looking at you, Riddick and Transporter. If we want to throw in more bald people in there, throw Bruce Willis in as well. That would be a great trio right there. Last night, I went to see The Hobbit: The Desolation of Smaug, and it got me thinking about the CGI that was used. Not just in The Hobbit, but in the previews as well. There was a preview for The Amazing Spiderman 2, and almost the entire trailer was CGI clips. Now don’t get me wrong, CGI can be used to do some great shots. However, the problem as I see it is that it can be greatly over-used. On some movies, this can be an intentional choice. Such as in Sky Captain and the World of Tomorrow, where pretty much the entire movie was CGI – this works in my opinion. However, when you need to mix CGI and live-action seamlessly, there can be a tendency more to be lazy with the live-action. 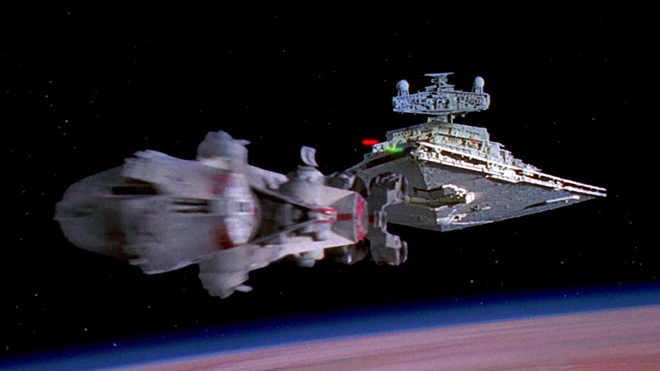 Before CGI, miniatures had to be made for everything, and miniatures almost always look better than CGI. Granted, these shots probably used CGI to cut two shots together, but in my mind this is an acceptable use of CGI. Creating an entire scene seems lazy. A constant stream of smoke came out of the gate. I never got this feeling from the movie; everything still seemed as though the dwarves had left the lonely mountain and nothing had really changed. To conclude, I think that this video shows what I’m talking about well; there are CGI elements, but it’s used more to tie two real shots together. Because of this, it really shows better what is going on, and everything seems more realistic. One of the problems with CGI as I see it is that everything seems too perfect; this is partly because of how the light is reflecting off of objects. Most of the time, everything seems too bright. The rest of the time, it generally feels off because the laws of physics seem to be broken; miniatures still have to follow the laws of physics.